At this GeoChat, Jim Young will talk about how Esri is helping governments and organizations across the world benefit from the Open Data movement—empowering people to make better informed decisions by enabling better data accessibility and greater insights than ever before. 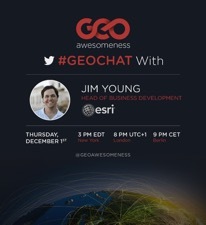 Include #GeoChat and tweet your question directly either to @geoawesomeness or to @esrilive during the GeoChat. It’s at 3:00 PM EST / 12:00 PST on Thursday, December 1, 2016.